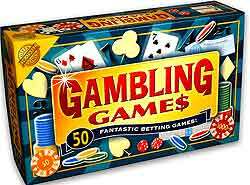 Gambling Games - 50 fantastic betting games! This brilliant collection of more than 50 gambling games brings you the ultimate in night-time entertainment! Guaranteed to satisfy your secret desire to be a cool risk-taker with a care-free money-don’t-matter attitide, this boxed-set brings home all the excitement of a casino ...but without the risk of losing your shirt! It comes jam-packed with gambling games of all varieties to test your nerve & set your poker face in stone. Are you wild enough for a game of Hooligan? ...wicked enough for Liar Dice? ...have you the balls for a round of Five Card Stud Poker?! Then, may luck be your lady tonight! Go on - get your mates round, dim the lights, top up your drinks and prepare to do battle ‘til dawn!